Correct and Conceal Base Coat. 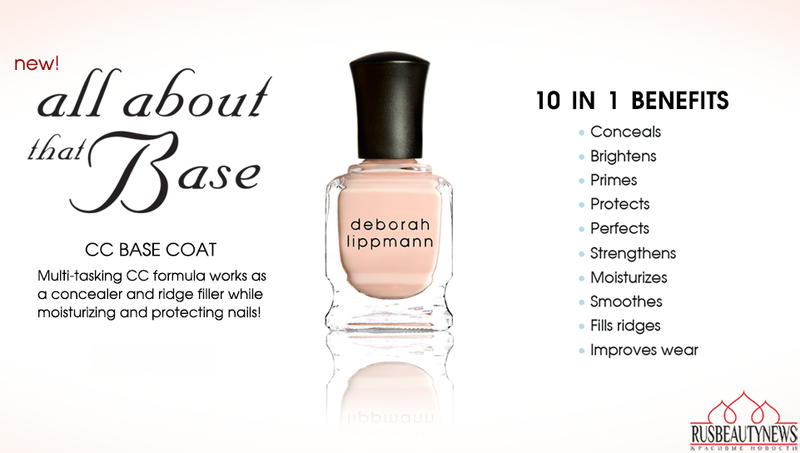 A multitasking CC formula that provides 10 nail treatment benefits and immediate nail-perfecting coverage in one. 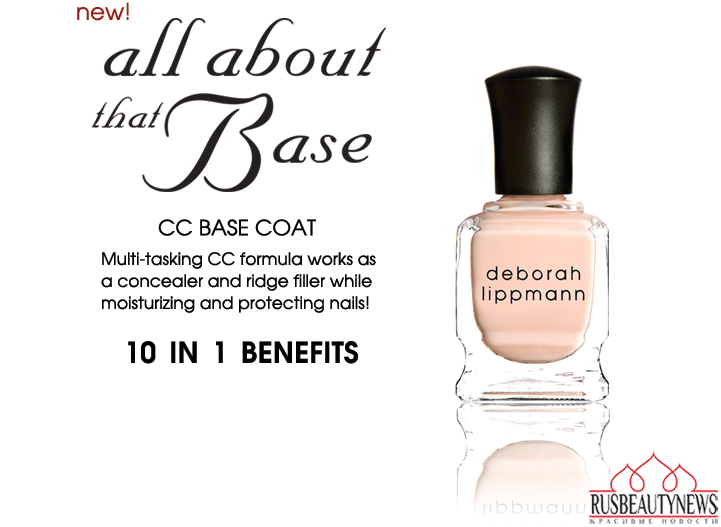 This CC nail treatment is formulated with a special hydrating complex infused with panthenol, which helps to moisturize, strengthen, and protect the look of nails while treatment correctors assist with concealing imperfections, brightening, priming, and filling in ridges for a smooth and matte, flawless-looking finish with improved wear. This multipurpose polish can be used as a base coat with one coat, or apply two coats for a matte, modern look. Deborah was inspired by the continuing success of BBs and CC creams in the beauty world. She believes that nails are like skin and must tended to with the same care. This product offers what her brand excels at: catwalk inspired colors and cutting-edge care. 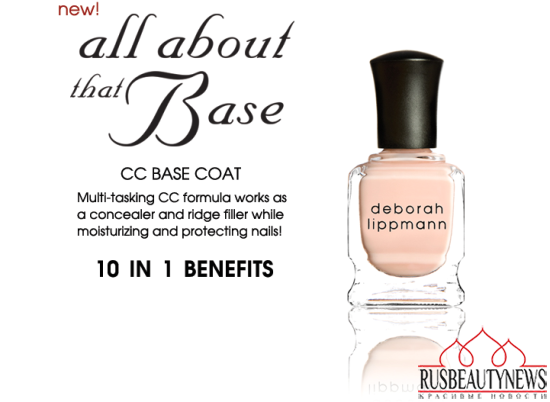 Deborah Lippmann выпустила сс-базу под лак All About That Base CC Base Coat. Вдохновением для создания нового средства послужила популярность ВВ и СС кремов для кожи лица. Дебора считает, что ногтям нужны такие же многофункциональные уходовые средства, как и коже лица. 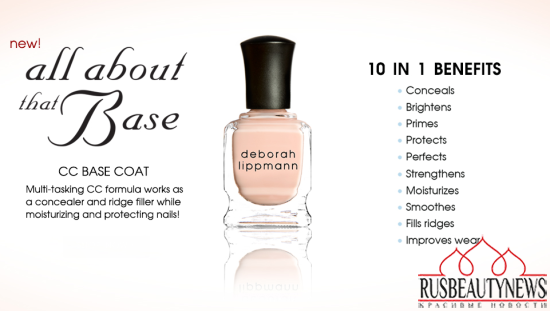 Многофункциональная формула 10-в-1 новой базы All About That Base CC Base Coat содержит пантенол, способствующий увлажнению ногтей а так же бета-каротин, биотин и различные масла, что в комплексе разглаживает, выравнивает, укрепляет, выравнивает цвет, предохраняет, улучшает… в общем, 10 удовольствий в 1. Новинка может использоваться непосредственно как база под лак или как самостоятельное средство. Имеет матовый финиш. Ethyl Acetate, Butyl Acetate, Isopropyl Alcohol, Adipic Acid/Neopentyl Glycol/Trimellitic Anhydride Copolymer, Nitrocellulose, Talc, Triphenyl Phosphate, Cellulose, Hydrated Silica, Trimethyl Pentanyl Diisobutyrate, Stearalkonium Bentonite, Tosylamide/Epoxy Resin, Benzophenone-1, Diacetone Alcohol, Citric Acid, Sucrose Acetate Isobutyrate, Dimethicone, Biotin, Water/Aqua/Eau, Camellia Oleifera Leaf Extract, Caprylic/Capric/Succinic Triglyceride, Aucoumea Klaineana Resin Extract, Saccharide Isomerate, Cocos Nucifera (Coconut) Oil, Butylene Glycol, Macrocystis Pyrifera Extract, Beta-Carotene, Retinyl Palmitate, Ascorbic Acid, Tocopheryl Acetate, Panthenol, Titanium Dioxide (CI 77891), Iron Oxides (CI 77491), Yellow 5 Lake (CI 19140). 10 удовольствий в одном флаконе-это здорово!